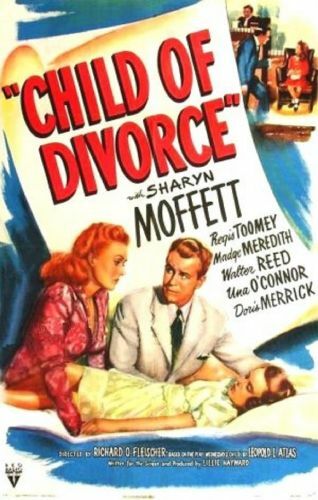 A remake of 1934's Wednesday's Child (itself based on a play by Leopold L. Atlas) RKO's Child of Divorce stars 11-year-old Sharyn Moffett in the title role. When her parents (Regis Toomey and Madge Meredith) break up, Sharyn finds herself in the middle of a bitter custody battle. It soom becomes obvious that her mother and father really aren't all that interested in her welfare, but are merely using her as a pawn for their own selfishness. Unlike most other Hollywood divorce dramas, this one ends on a downbeat note, which undoubtedly adversely affected its box-office appeal. Made on a shoestring, Child of Divorce was probably not intended to be a hit, but instead a "prestige" picture for the studio. The production represented the feature-film directorial debut of Richard O. Fleischer.